Indigenous to North America, the bald eagle is our national symbol and one of North America’s largest birds. Weighing in at about 8 to 14 pounds, it has a wingspan of 6½ to 8 feet. Females are larger than males. Adults are dark brown with a pure white head and tail. Younger birds are mostly brown, mottled with varying amounts of white. They acquire their adult plumage at 4 or 5 years of age. The use of the pesticide DDT and other environmental degradation factors in the 1960’s and 1970’s saw the endangerment of this majestic bird. By 1967, the bald eagle had been placed on the Federal list of endangered species. California further listed the bald eagle in 1971 on California’s list of endangered species. In 1972 a national ban on DDT took effect. At that time, the number of breeding pairs in California had dropped to an alarming 30 pairs. Largely attributed to the banning of DDT, the number of breeding pairs known to occupy territories in California is steadily growing. Along with this growth, the breeding range is expanding in California. 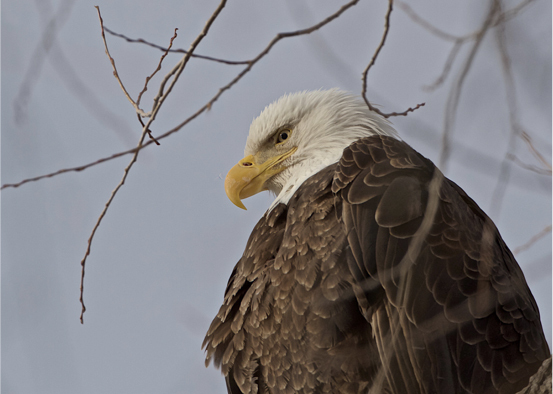 In 1977, bald eagles were found to be nesting in only eight counties. 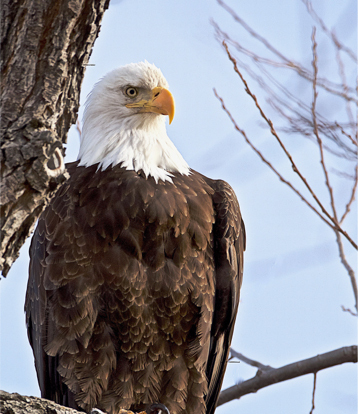 By the mid-1990’s, bald eagles nesting range had increased to 28 of the State’s 58 counties. Today, bald eagles can be found in 41 of the State’s 58 counties. Now I am able to photograph bald eagles in many parts of California. The above photo was taken at the Sacramento National wildlife refuge. There has been a bald eagle’s nest on the electrical tower above Calaveras Reservoir but with construction going on for over two years now and the road blocked I’m not sure whether the birds have remained. They often will reuse a nesting site year after year, rebuilding and adding to the nest each year. However, if the site becomes less suitable, they will move to another old nesting site within their territory or create a new one, making it sometimes difficult to track the pair. This photo was taken at Klamath National Wildlife Refuge at the Oregon Border. California is a favorite wintering place for the eagles. In the Sunol/Fremont area, bald eagles traverse the area on their way south to wintering grounds at Nacimiento Reservoir in the hills above Big Sur. Often they will stop to catch a meal of rabbit, squirrel or turkey on their way south and on the return trip north that starts as early as February. Their typical diet consists of small mammals, fish—including salmon and waterfowl, as well as carrion.